Do you know which schools in America are the most sports crazy? No, not Ole Miss, Alabama, or Florida. MIT and Harvard field the most intercollegiate teams – 41 and 39 respectively. One of the little known facts of higher ed. Belhaven has one of the broader NAIA school athletic programs with 14 teams. MIT will no longer be the leader with their announcement last week that they are eliminating eight sports because of budget cuts. MIT plays at the Division III level (no scholarships) while Harvard plays Division I in all their sports. High school students with dreams of competing in alpine skiing at the Massachusetts Institute of Technology, beware: when this academic year ends, the institute will no longer have a varsity team. That squad and seven others — competitive pistol, golf, wrestling, and men and women’s ice hockey and gymnastics — were eliminated on Thursday by M.I.T.’s athletics department, citing the need to trim $1.5 million from its budget. The institute said, however, that even in flush times, the 41 teams weighed heavily on the department, and that the cuts were intended to strengthen the remaining 33 squads. Some of the eliminated programs, like the pistol team, may become club sports, said Will Hart, the pistol coach. “We’ve been a varsity club since 1937, so this is something entirely new for us,” Mr. Hart said of the pistol program, one of the top-ranked in the country and one of the institute’s most popular physical education classes. 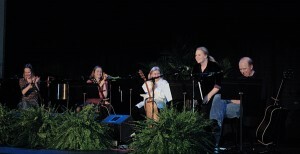 Five-time Grammy winner Mary Chapin Carpenter is still raving about the experience she had performing with Kate Campbell, Claire Holley and Caroline Herring at the Eudora Welty Centennial Concert in Jackson, Mississippi last week. Mary Chapin spoke to us from her farm–a sanctuary that she shares with her husband, six dogs, six cats, and a “menagerie” of other animals, all nestled securely up against the Blue Ridge mountains in south central Virginia. “It is pretty hard to leave home, but it was certainly worth it for the experience I had this last week in Jackson,” she said. To hear her tell it, the act of leaving her beloved home and animals is testimony to the regard in which she holds the literary giant Welty–who is not exactly a household word. Although critically acclaimed for their respective bodies of work, Mississippi daughters Herring, Campbell and Holley are not exactly household words either, but one might argue that they, along with Welty, should be. Mary Chapin Carpenter certainly thinks so. She was more than excited to meet the other performers. She was “anticipating” doing so. They are all so amazing. I have loved their music before I met them, I have felt a kinship with their music, and I have known Kate’s music for years. To finally meet after so long, well it was just wonderful. I was trying to tell a friend of mine about how extraordinary it was to be there with them. Every single one of them. Claire has such an angelic and interesting way of writing, and Kate’s writing is so masterful, and Caroline’s is so literary. It was like my cup positively overflowed. Their material was extraordinary. Something beautifully compelling happened onstage at the Belhaven College Center for the Arts. Carpenter provided the star power for the benefit performance, but more than that, she quietly and graciously deferred to the other women, learning their material, requesting their songs, and harmonizing in lovely support of the Welty tribute. Had she lived to reach her one-hundredth birthday, Eudora Welty would have certainly enjoyed this gathering of new friends on a sweet-scented southern spring evening. There was a hint of ozone in the air, a harbinger of thunderstorms that would roll through Jackson later in the evening. Welty often wrote about the weather and its ability to set mood and tone. In one of her best loved books, One Writer’s Beginnings, Welty described her father’s “country boy’s accurate knowledge of the weather and its skies.” Her art was firmly rooted in family and her fascination with the grownup world of storytelling that was part and parcel of southern family living. So I developed a strong meteorological sensibility. In years ahead when I wrote stories, atmosphere took its influential role from the start. Commotion in the weather and the inner feelings aroused by such a hovering disturbance emerged connected in dramatic form. No shy and retiring southern belle, Welty said she tried a tornado first. Some said they felt Welty’s presence at Belhaven last week, and it is not out of the realm of possibility. 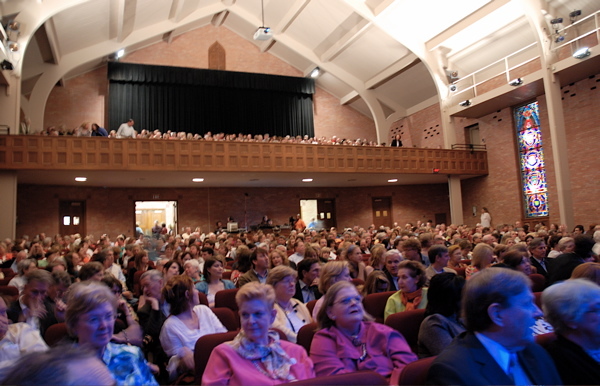 The 800-seat Belhaven Theater is a former Methodist Church, and there is something about a church that invites a visitation from the muse or a ghost. The stage was bathed in the glow of blue Fresnels that enhanced the sense of mystery and romance. Throw in the incredible artistry of four women who have the dirt, sweetness, and sweat of the south in their bones, along with songwriting abilities that summon aching memories of the pain, triumph and anguish of the South, and the profound becomes tangible–the impossible, possible. In many ways, the Eudora Welty Centennial event was a perfect marriage of the arts of songwriting and Welty’s literary storytelling. Mary Chapin Carpenter is a northerner and New Jersey born, but became fascinated with southerner Eudora Wetly and the power of her imagination when she stumbled upon One Writer’s Beginnings through a comment from a friend. The book is a bible, a talisman of sorts. It has meant so much to me. I was living in a scummy little apartment trying to be scrappy and eke out a living, when a very dear friend of mine quoted the very last line of the book. Our conversation was about struggle, and after I heard the quote I ran out and got it. I basically devoured it and found myself returning to it over and over again through the years. To this day I recommend it to any person I meet who is trying to establish a creative life within the requirements of making a living. It reaffirms what I am trying to accomplish for myself. Sometimes you are not sure of what you are trying to do; you are just trying to be happy. Before our conversation thread ended, I looked up the last line in One Writer’s Beginnings and read it to Mary Chapin over the phone. “As you have seen, I am a writer who came of a sheltered life. A sheltered life can be a daring life as well. For all serious daring starts from within,” Welty wrote. When asked why she opened the “guitar pull” in the round with the iconic Stones in the Road, Mary Chapin had the somewhat surprising answer that the song is an old friend and that the Welty tribute was her return to performing after two years. This was my first show in two years and I had taken extensive time off because I had a pulmonary embolism. We were all talking about how nervous we were and it was especially true for me because this was my return to performing. ‘Stones’ is about a lot of things, about struggle, certainly, and it is my calling card as well. The experience of having the embolism was terrifying. I had been having a lot of pain in my chest and luckily I got to the emergency room in time. It has taken me a long time to get back to my job. That is another thing that made it so meaningful to me–the fact that I was with such kind and considerate and lovely people in Jackson. The Welty connection “of all sorts of relationships” was made. The audience reacted as if it were greeting an old friend as Mary Chapin sang the opening lines of Halley Came to Jackson in a voice ringing strong and true with heart-felt emotion. The song and companion children’s book, illustrated by Dan Andreasen, is based upon Welty’s description of her father holding her in his arms as Halley’s comet appeared over the skies of Jackson in 1910. Another connection–a connection to the past–made through a combination of great songwriting and powerful vocal harmonies, just about brought down the house when Kate Campbell walked over to the grand piano to play Look Away. Mary Chapin said that she and Campbell locked eyes as the song began. It is one of Carpenter’s favorites. Campbell is a respected presence on the folk music circuit as well as National Public Radio, and her work has been compared to that of Welty and William Faulkner. Campbell introduced the song from her album Rosaryville with a vivid personal memory. I remember seeing Eudora on public television one night and there was a photograph of the mansion in Windsor, Mississippi behind her. I remember her talking about the New South and the Old South and along the way she said, ‘You know, not everything was bad and it doesn’t really matter where you are from, there is good and there is bad.’ She was talking about the Old South and she said ‘it really wasn’t all about hate.’ I, too, cannot believe that the history of the south is all about hate. It’s a long and slow surrender retreating from the past. It’s important to remember to fly the flag half-mast, and look away. I was taught by elders wiser, love your neighbor, love your god. Never saw a cross on fire, never saw an angry mob. I saw sweet magnolia blossoms. I chased lightning bugs at night. Never dreaming others saw our way of life in black and white. Part of me hears voices crying, part of me can feel their weight. Part of me believes that mansion stood for something more than hate. The moment was positively transcendent, and the audience became one family in the telling, all sons and daughters of the south. Carpenter, Holley, Herring and Campbell bravely shouldered this heavy sentiment in their songwriting and storytelling about the southland–each using compassion as a moral compass–each using the inspiration of Eudora Welty as a guidepost. A beloved Canton native, Caroline Herring is quite simply a treasure waiting to be discovered by mainstream America. Ten years ago, Herring established a strong following in the Austin music scene. Herring, like Campbell, does not shy away from the responsibility to tell the story of the south and shine the light of truth into the darker corners of southern history. With wit and grace that elicited laughter and warm applause from the audience, Herring also paid tribute to Welty. I do feel that Eudora Welty, like God, is looking down on me and saying, ‘Why have you not read everything that I have written?’ One thing I am struck with is the fact that she gives her characters such dignity through her honest portrayals of southern life in the twentieth century. Well, we are blessed to have had her in our midst. 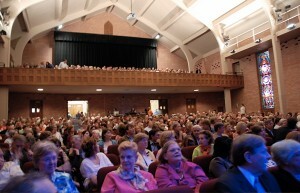 Music, friendship, and inspiration were front and center during the Welty Centennial Concert. “The chemistry was really there,” Kate Campbell said after the performance. The audience was with us and everyone was there to honor Eudora. This was one of the best ways to give tribute to Eudora– to have women singer/songwriters share their music and inspiration. Through music and storytelling, we can have a conversation, a dialogue. As performers it inspired us to be up there with three other women who shared the same passion. I asked her what she hoped to read in this article. She laughed. No journalist has ever asked me that question. When I got home from the weekend and we were all home again and when I parted from my manager and guitar technician and guitarist we remarked that it would be so hard to explain unless you had been there. It was an amazing experience. Describe how MAGICAL it was. I am so happy a (Huffington Post) writer has taken the time and interest in this. We ended the interview talking about Mary Chapin’s one and only meeting with Eudora Welty, some 20 years ago. I had tea with Eudora 20 years ago in her home. I was so nervous I could hardly talk. The way the house is now, it is like she just stepped out for a while. Books on couches; books everywhere. Her reading glasses on the table. I remember she gave me a book about Cajun music. I found that really interesting and surprising. It was one of the most memorable events of my life. She was just so gracious and kind. Welty passed in 2001 at 92, accomplished and beloved throughout the world. Perhaps for Mary Chapin, her daring came in her ability to triumphantly take the stage again after a very serious health threat. Eudora Welty found strength, solace and comfort in the company of friends, and so did Mary Chapin Carpenter. Four strong, talented women gathered in tribute to a woman who was a powerhouse of literary ability. In the gathering, they found friendship and reaffirmed their own abilities to use inspiration as the wellspring of creativity, courage, and terrific songwriting. Mary Chapin Carpenter’s 2007 CD, The Calling, was nominated for a Grammy for the Best Contemporary Folk/Americana Album. Her latest recording, released in 2008, is Come Darkness, Come Light: Twelve Songs of Christmas. Mary Chapin Carpenter serves on the Eudora Welty Foundation board. She is the only artist to have won four consecutive Grammy Awards for Best Female Country Vocal Performance. (1992-1995) She is currently working on writing and recording anew album and will be touring in support of it next year. Mary Chapin has recorded 11 albums, sold more than 13 million records, and scored 12 top 10 singles. The Eudora Welty Foundation aids in the cataloging of her manuscripts, correspondence, and photographs. The National Foundation for the Arts announced that the foundation has been awarded a $10,000 NEA grant that will support creative writing in 500 high schools. We just posted on the web a new video I recorded to address the question of cost of a Belhaven education. 1. Low costs: Belhaven College has been named a “Best Buy” college for 9 consecutive years. 2. Scholarships and Aid: 95% of Belhaven students receive financial aid. 3. Students will complete their degree on time. 5. Value: the most important financial investment of your life.